Shoe shopping can be a very complicated and confusing process. Choosing the proper shoe can ensure injury protection and provide proper distribution of forces. Whereas choosing the wrong shoe can lead to injuries and under performance. To add to this problem, there are many stores out there with self-proclaimed “professionals” giving out the wrong advice. This post will hopefully clear up some of these concepts and begin to lead you in the right direction in choosing your next shoe. 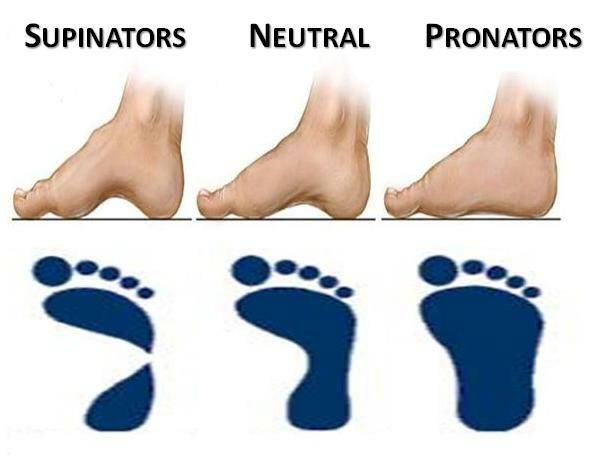 Keep in mind that this is a CONTINUUM and that each individual has a unique static and dynamic foot type. This is a simplification to help people categorize themselves into selecting proper footwear. It is always best to seek help from a professional when selecting the proper footwear for your activities. Everyone has a unique foot type. Try to understand where your foot lies along the continuum of the 3 different foot types (Right foot). Unfortunately most of us buy athletic shoes for athletic events and a static assessment doesn’t always translate well for the dynamic demands of sports and activities. However, having an idea of your static foot type will provide a good base knowledge for what type shoe your feet may need.